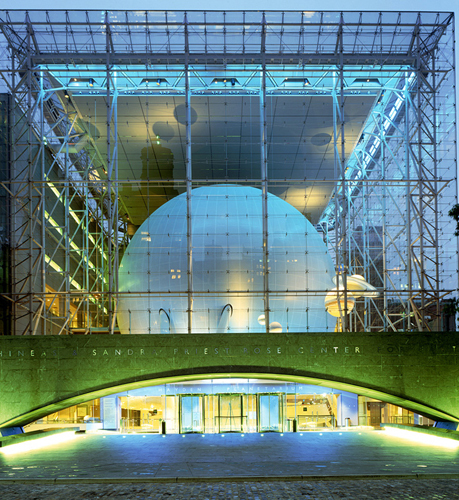 Opened in 2000 to explore inner earth and the outer universe, the dramatic exhibit building is a huge glass cube enclosing a three-story, 87-ft-wide sphere containing the new Hayden Planetarium. 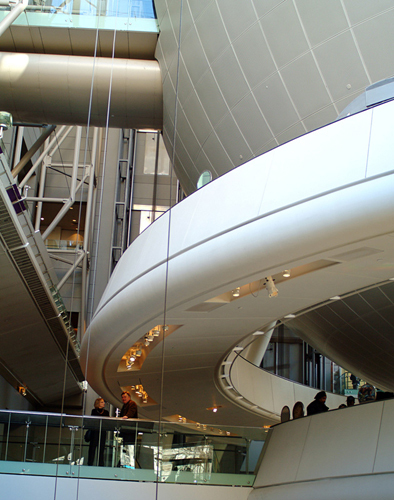 Exhibits, divided into the universe, galaxies, stars, and planets, show the discoveries of modern astrophysics. 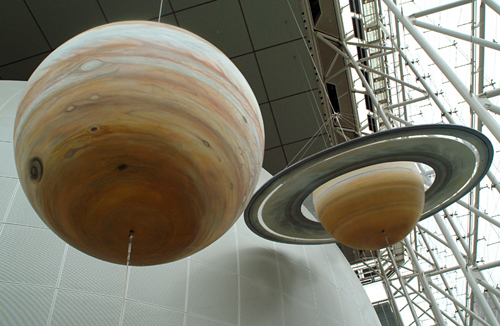 Digital scales measure your weight on Saturn, Jupiter, and the Sun. A sealed spherical aquarium in the Hall of the Universe holds a complete ecosystem of plants and animals that can recycle nutrients and obtain energy solely from sunlight. This high-definition screen displays the latest imagery from telescope observations worldwide and current NASA missions. Geological samples from around the world and videos explain the processes that formed the earth and continue to shape it. This globe, suspended above an amphitheater in the Hall of Planet Earth uses a projection system to recreate views of a rotating earth as seen from space. Events such as earthquakes or volcanoes are broadcast on a screen as they unfold. Other video stations show scientists at work. Models show the relative size of cosmic, human, and microscopic objects, from galaxies, stars, and planets, to the human brain and the smallest atom. Glass flooring around a circular opening lets visitors look down into a multisensory interpretation of the first movements of the universe. Explanatory narration is by Jodie Foster. The Big Bang exits to this sloping 360-ft pathway with astronomical images tracing landmarks through 13 billion years of cosmic evolution. The Hayden Planetarium, a remarkable advance in the study of astronomy and astrophysics, boasts a highly sophisticated Digital Dome System that is the most advanced high-resolution virtual reality simulator ever built. The space shows take place in a 429-seat Space Theater and are virtual flights through a scientifically accurate universe. It is advisable to order tickets for the space shows in advance, or to pick them up early in the day to secure a spot. Also showing is “Sonicvision”, hypnotic visuals set to a range of music, where digital technology is also used to illuminate the planetarium’s dome.